Grzegorz Domanski from Legnica UFO Research Club relates a story of an abductee from Legnica area, involving several dozens of abductions performed by unidentified beings and their after-effects. Wladyslaw S. multiple encounters with ET beings resulted in his interest in ecology and global politics. Wladyslaw S. wasn't previously interested in UFO phenomenon nor in environment protection, war counteractions or global politics. As the informer Halina L, stated, her mate was once a completely different man - he was more straightforward, vigorous and active person. The occurrence he experienced considerably changed his psyche and standpoint and initiated a firm changes in his mentality. His first contacts took place in the 2nd part of 1980’s and as he assumed, they cause a quite stir in his life due to missing time experiences, spontaneous electric appliances activation, dreams involving UFO objects and many others phenomena, described below. In that period he also used to find several blood drops on his pillow. Their origin seemed to be very mysterious since they didn't come from any visible wound or scar. Those matters may or may not be connected with UFO contact but it must be reminded here that similar events aren't usually firm evidences at all but in total they reveal a schema of abductions by Alien beings all over the world. As the witness claims, on every occasion and at least once a week, he used to experience missing time phenomenon taking place several times a day. Those time gaps were filled with unbelievable occurrences he was involved in. Grzegorz Domanski tried to stress the chronological order of particular encounters but it wasn't always possible. Although Wladyslaw’s encounters were nearly all the same, he doesn't possess conscious recollections of every one. Some of them, although completely real and material, were witnessed by him in an abnormal state of mind. The witness recalled also several other details but he isn’t certain if they were real or mingled with dreams. He relived many his experiences observing Nocturnal Lights manifestation during his stay at the seaside. But let’s go back to the most interesting experiences of Wladyslaw S.
Here is a possible schema of his cyclic abductions. It all begins usually at about 6 PM., when he finishes his work. Mr.Wladyslaw, as usually, closes his shop and is heading to his house in a certain village located several km away from Legnica. 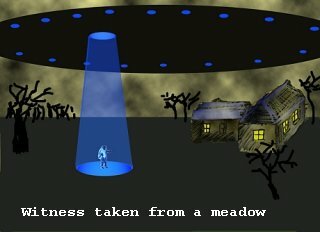 At this time he experiences the “missing time” and then he finds himself standing on a meadow in vicinity of his house. A huge craft, seemingly even bigger that the entire village is hovering directly over him. It is so giant that it’s hard to distinct its shape. Anyway, Wladyslaw stated that it was oval-shaped and long, with lighting points located around its perimeter. Each of those “illuminators” emanates blue, pulsating light. Then a beam of light descends upon him from above. It is of the same color. Then another time gap takes place. 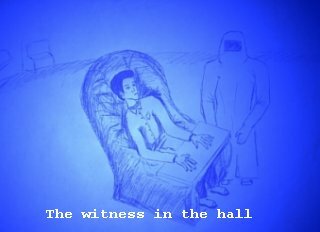 After a while the witness finds himself in a small, oval room filled with pale and dim light, as well blue in color. His stay in this room isn't long because after a while two strange entities appear by his side. Both are dressed in a loose kind of jacket, blue in color and glimmering metallic. Their dress consists of a hood with a rectangular visor, a cloak or jacket with broad gloves and legs. Wladyslaw is sure that despite that they're of the same height as we, they moved in a completely different manner: they shuffle without moving their legs as if they had wheels on their heels. The witness assumes that he is in an abnormal state of mind in which everything around seems unreal. He isn't absolutely able to move. He also doesn't feel a need to communicate with the entities remaining under their total command and will. 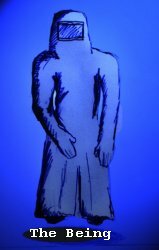 Then he is leading by a very long corridor – a tunnel filled with the same bluish light, although a bit darker. He hasn't got conscious recollections of his each trip via this tunnel but he takes it usually in an upright position and being suspended over the floor, he passively shifts along with these beings, as well as they without moving his legs. This particular convoy takes him finally to another one, more spacious room. The being dressed in jacket-like, bluish, metallic outfit with broad gloves and legs and hood with a visor. The spacious room is hall-like, oval-shaped and also filled with soft bluish light. There are many appliance of various kinds positioned on the walls around but Wladyslaw isn't able to describe them more closely. There are also other beings very similar to those who had brought the witness to this place. They are very similar to each other but lower parts of particular beings isn't composed of baggy trousers but ended with something resembling broad and one-pieced tunic. Wladyslaw is sitting on a broad, soft and very comfortable armchair with its frontal part orientated toward the hall central part. The armchair resembled that used by dentists but it’s slightly more oval. Aforesaid beings are moving around it, performing some undisclosed actions. Sometimes they are approaching him to perform particular examinations, touching the witness. As he stated, their touch always is very piercing. Some small plate that seems to be a part of the armchair is being bring in or it approaches him by itself. Wladyslaw put his hands onto it. In his head he can hear a voice repeating: “Don't be afraid”, “You'll be all right”. The witness doesn't see the voice owner; it definitely doesn't belong to any of the present beings. The person in question isn't probably physically present in the hall but it seems that “he” is superior to the rest of the beings, maybe even he controls them. Then the voice orders him to turn upside his palms, with their inner part turned upwards and then down and so on. After that “examination” the plate withdraws. Then Wladyslaw [remaining in sitting position], receives from the voice a mass of information pertaining ecology, global politics and life conditions as well as the existence reason. The message has rather a form of his subconscious stimulation since the transfer isn’t so clear as the previous orders and it isn't expressed by means of specific words. There is as well something resembling a three-dimensional movie show accompanying the message. After some time spent in the hall, another time gap takes place. Then the witness unexpectedly finds himself again on a meadow neighboring to his house but that time there is no craft above. On certain occasions he could recollect some vague memories in the morning of the next day, being in his house but he usually wasn't aware how long his onboard UFO experience lasted and when he was taken back. When he was about to go to work with his car, he noticed on several occasions that the car wasn't on his yard as usual. In similar instances he was forced to go to Legnica by bus, finding there his untouched car parked by his shop. It is the end of the scenario of his manifold onboard UFO experiences but another intriguing details were then given by Mr. Wladyslaw. It turned out that his abductions frequency was changing along with time. At first they were regular, i.e. once a week then became occasional. The witness was harassed by ET beings for about a year and half and then 2 – year – long gap took place. Then 2 or 3 abduction incidents occurred but were divided with long intervals. The witness claims that he hasn't been abducted for several recent years but his contacts might take place in different forms and his memories were withdrew or remained hidden deeply in his mind. After one of these visits the witness noticed in the following morning [exactly on the inner part, on his thumb], a small, protruding and very hard element in mustard-seed size on his left palm. He isn't able to rationally explain its origins. Anyway he came to an idea that Alien beings had implanted him, placing some element under his skin. Asked if he has tried to remove it, he said that the Aliens would be displeased with his deed and he would provoke another wave of unpleasant encounters. The witness agreed to restricted examination of this protuberance by X-ray. 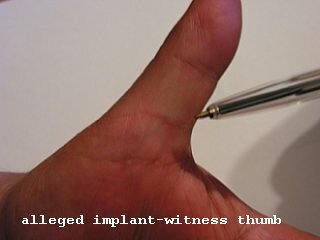 He also would like to get to know if it is an artificial implant. Wladyslaw S. was also offered a regressive hypnosis session but he is reluctant. He claims that he would agree but if the session won't cause any harms in his psyche. Legnica UFO Club is going soon to X-ray Mr.Wladyslaw’s hand and skull to verify along with out confidant doctor implants presence in the witness’ body. Regressive hypnosis session will be also performed in the nearby future.